The 1970s and 80s were a tumultuous time for many U.S. family farmers. After President Nixon ended the U.S. dollar’s convertibility to gold in 1971 to curb inflation, all commodities—from grains to oil—soared in price. Then USDA Secretary Earl Butz sold off U.S. grain reserves and told U.S. farmers to plant from ‘fencerow to fencerow’, which many did. Grain prices remained high for several years and farmers were emboldened to take on more debt to acquire expensive new farm implements, updated cropping systems and more land. As scarcity became oversupply, grain prices fell and profits disappeared, farmers realized that the New Deal farm program was destroyed. As banks and other lenders demanded repayment for the expansive loans they had provided, many farmers planted even more hay fields and pastures to sell more grain to compensate for the low prices they received per bushel. Trade groups, such as the American Soybean Association, and the American Farm Bureau finally acknowledged this disaster when plummeting land and machinery prices created a banking crisis. At that point tens, of thousands of farmers faced foreclosure and felt they had no alternative, but to sell their farms—which meant losing their homes, livelihoods, and standing in their communities—to get out of debt. Some joined tractorcades, organized by the American Agriculture Movement, traveling hundreds or thousands of miles to Washington, DC, seeking support for 100 percent of parity—a price floor based on a crop’s cost of production—and a moratorium on foreclosures. With but a few champions in D.C., foreclosures, auctions, and suicides escalated throughout farm country. Meanwhile, grassroots activists were organizing in their home states to help farmers, their families and their communities to manage this crisis. Groups were formed in states from Vermont to the Carolinas, from Virginia to California and from Texas to Minnesota. When the federal government offered little to no hope or support, Willie Nelson, Neil Young, John Mellencamp, and dozens of musician friends held a day-long concert called Farm Aid on September 22, 1985, to call attention to the farm crisis and raise funds for farmers in crisis. In January 1986, with Farm Aid’s support and encouragement, a number of grassroots advocacy organizations, including the American Agriculture Movement, Federation of Southern Cooperatives, Land Loss Prevention Project, Missouri Rural Crisis, Northern Plains Resource Council, and more, established the National Save the Family Farm Coalition, dba National Family Farm Coalition, or NFFC. These leaders agreed that NFFC should be established as a coalition of advocacy organizations, not of individual members. NFFC would be stronger at the onset with an existing base of groups, some with hundreds or thousands of individual members, working from different states toward common goals at the federal level. It would also be easier to organize events and outreach for developing policy recommendations that NFFC would represent to Congress and the administration. The NFFC was built on two main tenets: raising crop prices in the marketplace to parity to promote family farm agriculture, while eliminating the tax burden of deficiency-payment subsidies; and, encouraging sound environmental farming practices, in part through a ‘bushel-based’ supply management program. These commonsense approaches, which would have kept farmers afloat and from planting every square inch of bare ground in order to stay afloat, were not so common among government leaders. Although farmers have historically been reticent to ask for government assistance, their outreach in the late 70s and early 80s went largely unanswered, amplifying the need for their message to be heard more often in face-to-face meetings by people with influence. Serving as a founding member of the Community Food Security Coalition, which grew to include roughly 300 organizations that helped establish and/or sustain equitable national food policies and programs, including Farm to School and Farm to College networks, Supplemental Nutrition Assistance Program, and Community Food Projects Competitive Grants Program. Working with allied and member organizations advocating for the development of national organic standards to rally 250,000-280,000 public comments in 1997. Protecting the rights of farmers to save their seeds and purchase non genetically engineered seeds through the Farmer Declaration on Genetic Engineering, released just prior to the World Trade Organization Ministerial Conference of 1999. Suing Monsanto for not testing GE seeds for safety before public sale and for requiring farmers to ‘license’, not buy outright, their seeds and suing the Environmental Protection Agency for deregulating Monsanto’s Xtend cropping systems, despite warnings about crop damage from dicamba drift. Highlighting farmer concerns of Monsanto’s rBGH to the public and numerous retailers, including creameries, who eventually served/sold milk products only from cows not treated with rBGH, and enabling retailers to apply labels to such products for public knowledge (along with Monsanto’s message that milk from cows treated is deemed safe), which ultimately resulted in Monsanto selling its rBGH division. Stopping the deregulation of Monsanto’s GE wheat with allies in different coalitions and influencing Rep. Dennis Kucinich to hold a hearing to investigate APHIS’ (Animal and Plant Health Inspection Service of USDA) negligence to farmers after an accidental release of GE wheat and rice near non-GE fields. Joining La Via Campesina, the international peasant organization supporting communities world striving toward food sovereignty. Activities have included international conferences to develop declarations and platforms; UN Climate Change Conferences of the Parties; agroecology learning encounters; protesting free trade agreements; and helping foil the Doha Round of the World Trade Organization. Participating in hearings, sign-on letters and editorials with Citizens Trade Campaign to voice farmer and farmworker concerns over NAFTA renegotiations, including U.S. pressure to Canadian dairy farmers to drop milk supply management program, reintroducing Country of Origin Labeling, and removing investor state dispute settlement. Raising ‘Competition and Concentration in Dairy’ concerns through a farmer member’s white paper assessing sustainability of large dairy farms that launched investigations by Chicago Tribune and Department of Justice; pressuring government agencies to investigate the illegal use of milk protein concentrates; and, offering recommendations for price floors, and farmer-managed supply and other policies in legislation introduced by Senators Casey, Specter, Sanders and Leahy over the past 20-plus years. Promoting and supporting credit counseling and emergency disaster relief for farmers, in particular after Hurricanes Katrina and Rita in 2005; and co-authoring a 2011 report on the credit conditions affecting farmers, Don’t Bank on It, which provided the basis for briefings with White House Domestic and Rural Policy Councils, as well as policy proposals for 2012 Farm Bill credit title. 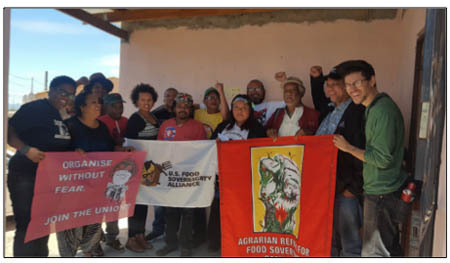 Co-founding the US Food Sovereignty Alliance with members of the U.S. Working Group on Food Crisis after the Nyeleni 2007 Forum for Food Sovereignty. Since 2010, USFSA has awarded the Food Sovereignty Prize to national and international grassroots organizations whose work lifts up food sovereignty in their communities. Joining with Rural Coalition, Community Food and Justice Coalition, Food and Water Watch, and other organizations to advocate for access to educational and fiscal resources by socially disadvantaged farmers and ranchers, particularly during the Farm Bill process, which has helped maintain funding for Section 2501 programs. Working with faith-based and environmental organizations to publicize the procurement of farm land in the U.S. and forest land in Brazil by university pension fund manager TIAA, which has since posted more information regarding the location of their U.S. farms and is slowly being pressured to reveal and divest of these investments by pension holders throughout the U.S. Introducing the concept of InterDependence between family farmers, community-based fishermen, and eaters at Farm Aid 2017 Homegrown Village exhibit by engaging exhibit visitors to help write its Declaration. Collaboration can be difficult but it is essential for the larger wins—those that ultimately benefit everyone working to grow, catch, harvest, process, transport, market, and serve our food. For all to achieve food justice and food sovereignty, there is an unspoken agreement that such change will not arrive quickly, simply or easily, but few would argue that anything worthwhile ever is.